Being caught between two worlds is never easy. You are constantly caught in an emotional tug-of-war with both parts of your existence demanding allegiance and attention and refusing to accept a phoned-in part-time presence. The end result for most people? A sense that you don’t belong in either world and a sense of apathy, disconnection and disillusionment. That’s the theme of Stephen Page’s debut Australian feature film, based on a breathtakingly imaginative 37 minute dance performance (part of the Skin double bill from 2000) by the famed Bangarra Dance Theatre. Its translation to a near-wordless, considerably-lengthened film is stunning, visually immersive and beautiful, every bit about the emotions as the deeply-involving story. 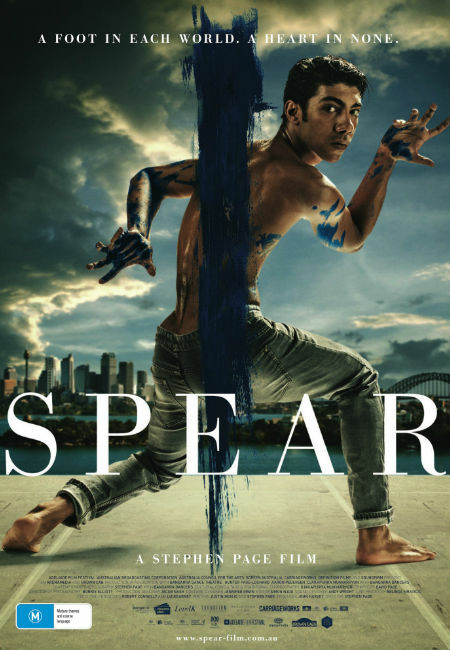 “Descriptions of Spear, a strange and beautiful beast adapted from work developed by Sydney’s Bangarra Dance Theatre, will suggest a film that is, God forbid, unique – a word almost entirely extinguished from the cinematic lexicon. And original it is, a meaningful piece of artistry that is definitely worth catching. Spear premiered at the Adelaide Film Festival in October 2015 and is available in various formats for downloading and viewing.